Barrier Group Pty Ltd presents surface mount removable bollards designed for applications where the floor cannot be core drilled or penetrated. Available in two models, these bollards are ideal for installation in suspended, pre-stressed slabs or clean areas such as food preparation or pharmaceutical processing zones. Barrier Group’s surface mount removable bollards are supplied in Cam-lok and Tee-lok options. Though structurally identical, the two bollards offer different locking systems to suit the level of security required. 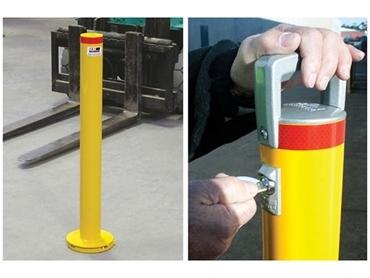 Cam-lok surface mount removable bollards are heavy duty bollards that lock into the surface mounted receiver shoe via an internal locking system, which utilises a high security cam lock with registered keys. Two keys are supplied with each order. The surface mount Tee-lok features the unique ‘T’ handle key to unlock and remove the bollard from the receiver shoe. Tee-lok is ideally suited for low or medium security applications, where the aim is to stop vehicles entering unauthorised areas or separating vehicles from pedestrians, especially around workplaces.